Well, I am a happy bunny - or a happy witch, anyway. The website looks great too. 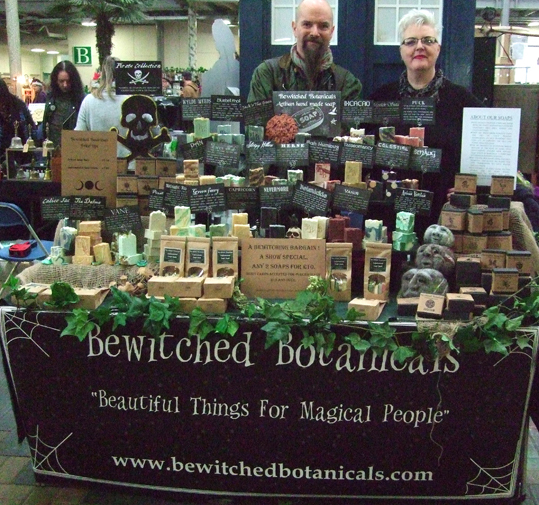 Jacqui and Steve, who make all the Bewitched Botanicals products, are regulars at pagan festivals and witchy markets. 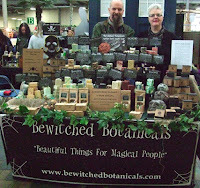 I've been buying the most amazing soaps from them every time I see them at an event. The photo on the right is one I took at the Enchanted Market earlier this year. 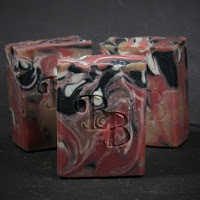 All of their products are made with natural ingredients, but what I really like about them is that they smell and look wonderful - and have names you could probably conjure with! The prices are very reasonable and they use the most environmentally friendly packaging they can get. Sadly, I've now run out of the soaps I bought when I last saw Jacqui and Steve - and I have presents to buy. Being so busy at the moment, I wasn't going to have time to get to anywhere Bewitched Botanicals will have a stall before Yule. That problems is now solved. I'll be buying online. I do have another problem though - do I go for my favourite Smaug soap or do I try something new? I'm pretty tempted with the new Yule collection including Krampus soap and Black Phillip Yule Cauldron bath bombs.